For the arcade game that Double Dragon Advance is a remake of, see Double Dragon. 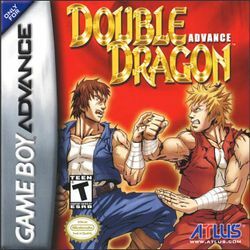 Double Dragon Advance (ダブルドラゴンアドバンス, Double Dragon Advance?) is a 2003 side-scrolling beat 'em up released for the Game Boy Advance. It was published by Atlus and developed by Million. It is a remake of the 1987 arcade game named Double Dragon and it incorporates elements from the original's sequels and home versions. This page was last edited on 21 August 2012, at 17:43.